Even thou being from Oregon, I am actually closer to the other major training schools (which by the way I contacted) and I could have save money by going there, but after talking with Robert I knew I was going to be trained by the Best of the Best. Now that it's over, if I had to do it all over again, I would make the same choice! Excellent instructing and teaching skills. Jaymi and Robert were very knowledgeable and patient with great strategies! Overall GREAT experience! After taking the full 7-Day course…I am speechless, in a good way! 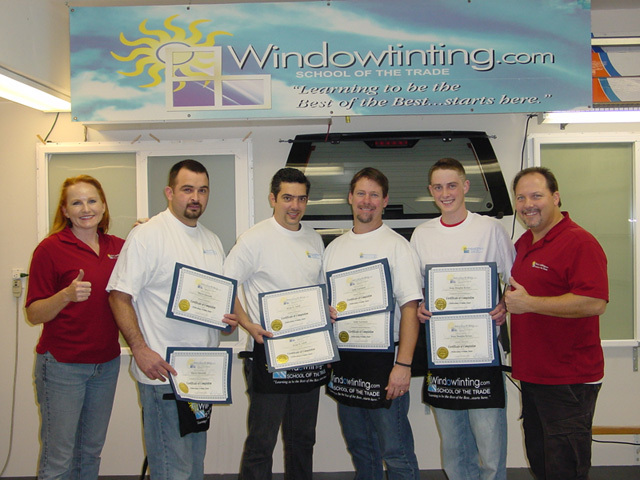 Windowtinting.com throws a lot of information at you in what some would consider a brief amount of time; yet you never feel overwhelmed. They create a laid-back atmosphere that gives you a positive learning experience. I definitely recommend this class and my only regret is that my schedule did not allow me to stay with my classmates in the Business Management Course; which I did however purchase the files! The training was thought-out and the program was scheduled very well. Great atmosphere for any age to learn from - fun and exciting at all times; you get that being at home feeling as well! I will definitely recommend to other if they ask. I enjoyed every bit of it, including the Flat Glass and Business Management course, as well…oh, and the lunches were awesome too!! !